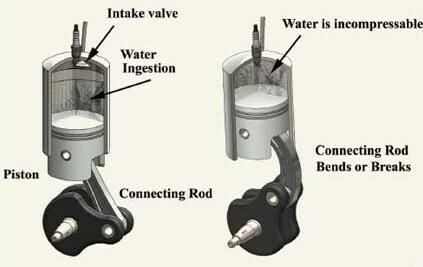 Hydrolock (short for hydraulic lock) is the immobilization of an engines pistons by a liquid such as storm/rainwater. Automotive engines are designed to compress a gas/air mixture. If a significant amount of water is sucked into the engines combustion chamber through the air intake, compression becomes impossible. As a worst case scenario, Hydrolock Car Engine will cause significant engine damage. 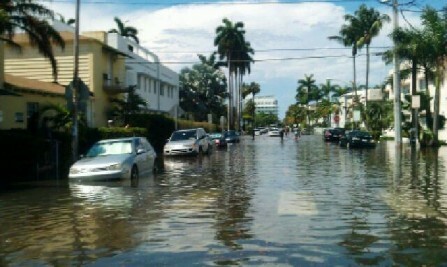 During the South Florida rainy season we see this problem a lot. It can happen so easily - you are driving through standing water caused by a rain storm when water enters through your engines air intake system. Your engine comes to an abrupt stop and will not restart. When hydrolock occurs on a BMW Mercades Benz Mini ooper - Volkswagen or Audi, it might not always cause catastrophic damage, when a turbo engine experiences a Hydrolocked Engine it usually is less damaged than a non-turbo engine. Damage caused by hydrolock may not always be obvious. For example, a slightly bent rod (a common problem) will not have a notable effect on the way the engine works but it will eventually cause damage on the bearing. Other parts of the engine, such as the camshaft, timing chain, timing belt and piston skirts could not have apartment damage, but could later contribute to major failure of the engine. Repairing a Volkswagen or Audi engine with Hydrolock, its a job for experts only. At German Car Depot we are experts! The factory warranty on new cars will always deny a claim for hydrolock but if you have full coverage auto insurance, the damage caused by hydrolock will be covered. Other examples where insurance may cover hydrolock damage is if you are parked at a business and the parking floods or at a house/apartment building where homeowners insurance may cover the damage. At German Car Depot we have a strong understanding of how insurance companies work and will work your claim from beginning to end. Even if you don't have insurance, German Car Depot is the shop to perform this complicated engine repair. We work with our customers at a personal level and can adjust a repair to meet your vehicle's needs and still be within your budget. Towing We offer free towing 24/7 to German Car Depot service center for any Volkswagen or Audi vehicle with hydrolock. Call our preferred towing company TLC Towing. Their telephone number is 954-564-0486, they will bill us for your towing. TLC knows exactly where we are located and what to do with your car and keys. There is no need for you to come with the car. You can also call us. If it's after our office hours, leave us a voicemail. You might qualify for a free loaner/rental car. Please call us for more details.